Finally! A potato cheese soup I can love. After my previous attempts left me pondering similes (like swallowing a cup of cement? 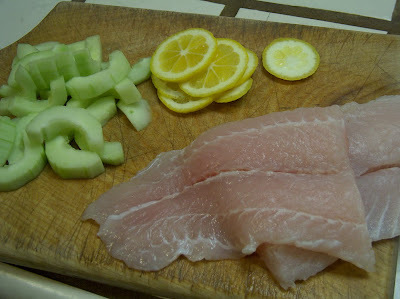 ), this version found my taste buds dancing and my ladle serving up seconds. Best of all, you're likely to have all the ingredients you need already on hand. In large pan, heat oil. Cook garlic, potatoes, and onions for about 10 minutes over medium heat, stirring occasionally. Add chicken broth and salt, bring to a boil, lower heat and cover for about 20 minutes. Vegetables should be well-cooked by then. Add milk. Heat through. 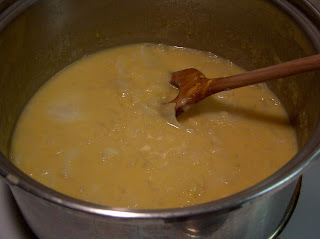 Add cheese before serving and stir until melted (or nearly melted). 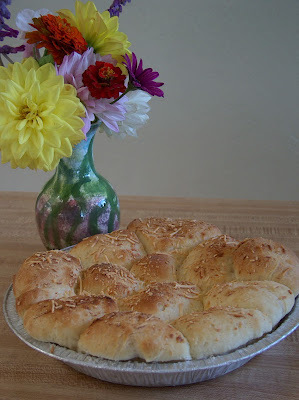 NOTE: Hop over to Tammy's Recipes for Kitchen Tip Tuesdays. Here's another option for the "oh-no-the-bake-sale's-tomorrow-and-I-have-no-time-to-make-anything" dilemma. Just three ingredients. Chocolate chips, sweetened condensed milk, and graham cracker crumbs. 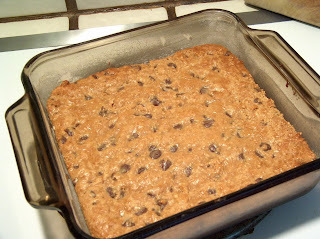 You mix them together, plunk them in a 9" x 9" pan, bake for 25 minutes, and you're done. Combine all ingredients in bowl, stirring thoroughly. Spread in well-greased and floured 9" x 9" pan and bake at 350 degrees for 25 to 30 minutes. Makes about 20. Welcome to my happy little kitchen, where I love to bake killer garlic cheese rolls, steam salmon in my dishwasher, and creatively use up all those heaps of leftover Thanksgiving mashed potatoes. I started blogging about six months ago. It seemed like a great alternative to bombarding friends and family with recipe-filled emails. I also hoped to be on the receiving end of tried and true favorites from other bloggers and food lovers. Thankfully, that part has worked out swimmingly. Through this blog I've discovered Molly's Outstanding Spinach Salad, DarcyLee's Molasses Oatmeal cookies, Jana's Fried Rice, and many other new favorites. My biggest blogging challenge has been sticking to food. A part of me really wants to tell everyone that we had to put our 12-year-old yellow Lab down down two weeks ago. Or to show you the crazy quilt project I'm making from leftover fabric scraps. But I am valiantly trying to stick to topic, which means my best alternative is coming to visit you at your quilting, book-loving, home-loving blogs. So welcome, I hope you'll stay and poke around a bit, and remember, anytime you come across a great recipe that's simple, fun, tasty, or chocolate-filled, I hope you'll think of me. Sharing is good. We like sharing. Note: To go see who's making all those merry noises at the blog party, check it out here. All kinds of prizes are being offered. March 27 is the end date. Love those chicken drumsticks. They're inexpensive, quick to cook, and oh-so-tasty. This recipe has exactly two ingredients: chicken drumsticks and orange marmalade. Three ingredients if you count aluminum foil. Four if you count salt. Get out one or two baking sheets with sides and lay down some foil. 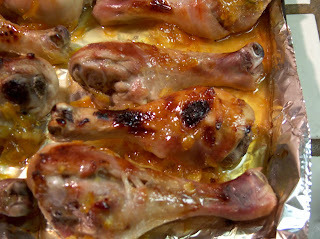 Place on foil as many chicken drumsticks as you want (we made about 24, for a crowd). Sprinkle with salt. Bake at 475 degrees for 10 minutes. Brush with about 1/2 c. orange marmalade, and rotate pans. Roast for 10-15 more minutes, brushing with 1/2 c. more marmalade halfway through cooking. Once chicken is browned and cooked through, dig in. This recipe is from Martha Stewart's Everyday Food magazine, April, 2009 issue, which I get because my sweet, sweet friend Estella sent me a subscription. Thanks, Estella. 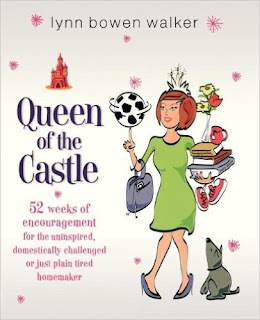 Well I've got my favorite recipe for chocolate fondue (p. 123 in Queen of the Castle -- a great book, by the way :) ). And I've got my favorite thick chocolate sauce recipe to use in crepes (p. 301 in The Encyclopedia of Creative Cooking -- another great book, by the way). But I've been searching FOREVER for a stellar chocolate sauce that would be perfect for ice cream. Not too thick, not too gloppy, not too runny. A very Hershey's sauce. Is that too much to ask? Apparently it was, because I've been looking for a very long time. But glorioski. I believe I've finally found it. I've seen similar recipes on a few blogs, but this one came from a small cookbook I bought a few years ago from the Hearts at Home organization (called Recipes from the Heart). 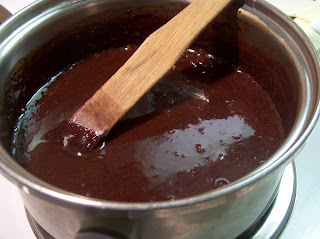 Boil cocoa, sugar, water, and salt, stirring constantly. (You may want to do this over medium-high heat rather than high to avoid the chance of scorching.) Remove from heat and add vanilla. Pour over ice cream and slurp up the deliciousness. Pour remaining sauce in a jar and refrigerate. Does anyone else have killer chocolate sauce recipes that the rest of us simply must try? NOTE: Check out more great Works-for-Me-Wednesday ideas here.
. . . as in, covered with cheese, not cheesy as in, of poor quality; shoddy; inadequate. This recipe comes from a little spiral-bound cookbook I own called Shortcut Cooking: The Earth-Friendly Energy-Saving Cookbook by Favorite Recipes Press. 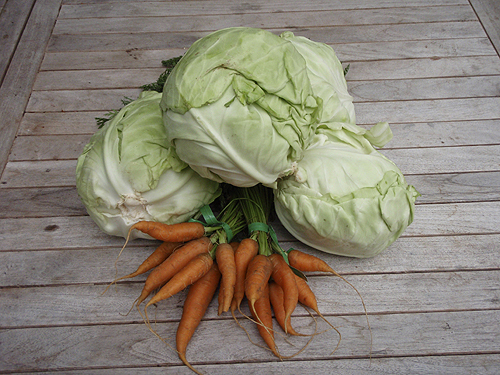 This is the perfect St. Patrick's Day side dish, if you've already got a wee bit 'o corned beef planned. NOTE: For more great St. Patrick's Day food ideas, check out the Ultimate Recipe Swap going on over at Life as Mom's blog. Ann Kroeker is hosting a wonderfully practical carnival called Make-Do Mondays, where readers can link up their ideas on how they and their families are living out the slogan, "Use it up, wear it out, make it do, or do without." In honor of Make-Do Mondays, I thought I'd share a little wisdom I've been learning about buying fish. You know. Seafood. To eat. In my quest to find out if certain types of fish were currently in season, thus better buys, I went to my library and checked out The Complete Seafood Cookbook by Bettina Jenkins and Jane Brody's Good Seafood Book by Jane E. Brody with Richard Flaste. NOTE: Check out Works-for-me-Wednesday for some great tips and ideas. This recipe came from an old Taste of Home magazine. 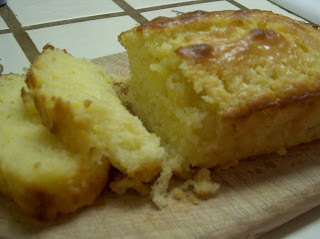 It's called lemon bread, but you could also call it lemon cake and probably no one would put up a fuss. In large mixing bowl, cream butter and sugar. Add eggs, lemon juice, and lemon peel. In small bowl, combine flour, baking powder, and salt. Add flour mixture to batter, alternately with milk. Pour into greased loaf pan and bake at 350 degrees for 45 minutes or until toothpick in center comes out clean. Combine glaze ingredients and drizzle over loaf while still warm. Note: If you find yourself with an overabundance of lemons right now, you might want to try lemon curd, gingerbread with lemon sauce, hot spiced lemonade, lemon soup, frosted lemon ricotta cookies, or lemon honeyed fruit. You know. In case you have too many lemons. Or maybe that's just me. One of the hazards of blogging about food is being mid-bite at dinner and remembering, "Oh no! I forgot to take pictures!" Because what's a recipe with no pictures? Like a dog with no fur to pat, or a fire with no heat. Just not . . . quite . . . right. This recipe (with a couple of changes) came from Fix-It and Forget-It Cookbook by Dawn J. Ranck and Phyllis Pellman Good, one of several crockpot cookbooks I own. Butter the bottom and sides of crockpot. Remove the green chilies from can, cut into strips, and place on bottom of pot. Cover with cheese, then add stewed tomatoes. In separate bowl, stir together eggs, flour, and evaporated milk. Pour on top. Cover. Cook on high 2 - 3 hours (I cooked mine on low for 5 hours). This was tasty, and a bit different from most of the stew-type crockpot recipes. Now I'd love to hear about your crockpot favorites, either specific recipes or cookbooks you've had good luck with. Note: For more great homemaking ideas, check out Works-for-Me-Wednesday. Isn't this the most beautiful artichoke patch you've ever seen? This is in our back yard, thanks to the resident gardener (aka The Big Kahuna) and the Master Gardener (you can meet Him in the book of Genesis). 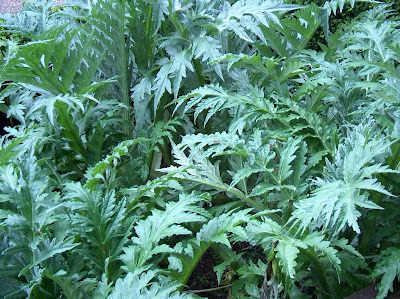 If last year is any indication, before long we will be swimming in artichokes. 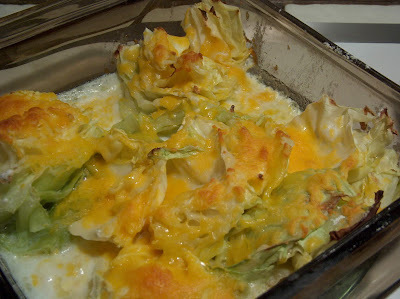 Anyone have artichoke ideas to share with the rest of us?
. . . other than Irish soda bread, that is.